Reverse Osmosis Filter - Caware International Co., Ltd.
Caware International Co., Ltd. is a highly-qualified, Taiwan-based supplier and manufacturer of Reverse Osmosis Filter (RO), Water Purifiers, and Cartridges. The supplier has been recognized as one of the most professional manufacturers in the industry since 2005. With both experience and innovation, the supplier is confident of providing buyers with quality quality Reverse Osmosis Filters. Reverse Osmosis Filter manufactured by Caware are designed as a post in line RO filter with coconut shell activated carbon of NSF61 certification and produced in compliance with CE, UL, NSF, and FDA requirements. Reverse Osmosis Filters are manufactured according to Reverse osmosis (RO), which is a water purification technology that uses a semipermeable membrane. This membrane-technology is not properly a filtration method. 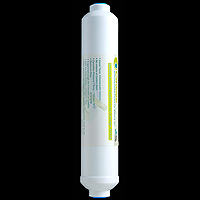 Caware's Reverse Osmosis Filter (ROF) provides filtered water quickly. In addition, by bringing in RO technology, it has gone through extensive tests so as to ensure the removal of harmful contaminants. Nowadays, household drinking water purification systems, including a reverse osmosis step, are commonly used for improving water for drinking and cooking. Currently, Caware's ROF is widely used in households, restaurants, spas, or pools to ensure cleaner and safer water. If you have any interest about our products, please feel free to contact us for further details about our Reverse Osmosis Filter. Media with granular Coconut catridge shell activated carbon of NSF61 cert. Taste improvement for post in line filtering. Manufactured in compliance with NSF and FDA requirement in materials, media and processing. Applications for POE usage for Whole House Filtration, Restaurant and Food Service, Water Filtration, Spa and Pool Filtration.